If someone is considering converting their gasoline driven car to run purely on electricity via a Do It Yourself (DIY) project at home, how practical would it be? Firstly, we have to understand that the process of retrofitting a car to electric is like “heart surgery” for the vehicle. We are literally taking out the [tag-tec]internal combustion engine[/tag-tec] and replacing it with an electric motor. It is fair to say that is a quite a tough job. Not everyone would have to skill and knowledge to convert a car to electric vehicle (EV) at home. To do so, you must be well versed with the internal components and parts of the car. You would also need to have all the necessary tools and the knowledge on how to use them. You must have electrical and wiring skill to connect all the electrical components to the batteries through all the safety switches and fuses. You must also have machining skills because some of the metal parts are not available off the shelves and have to be custom made. A DIY electric vehicle project may not be a good idea for a lay person. You can try to carry out the retrofitting and most probably you would need lots of help. If you don’t think you can convert a conventional car to run on electricity, you should outsource the project to a professional mechanic. The best you can do is learn the ins and outs on an EV. If you want to know what’s involve in an electric car conversion project, check out Gavin Shoebridge’s Electric Conversion Made Easy e-book. Gavin made a name for himself when he converted an old Mitsubishi Tredia to run on electricity. He actually documented his conversion process on videos and posted it on YouTube. Gavin’s electric car conversion manual was written based on his actual experience converting the Tredia. The information in the manual is as detailed as it can get. He’ll show you what are the parts and components he used for his EV down to the individual model number. For those who like to learn by watching videos, there is also a series of 10 new High Definition (HD) instructional videos included with the manual. The videos go through step-by-step from choosing the right donor car to getting the car certified street legal. ==> Click here to visit Electric Conversion Made Easy now! 3) What is an electric motor – An electric motor is a device using electrical energy to produce mechanical energy, nearly always by the interaction of magnetic fields and current-carrying conductors. Thank you for visiting my blog. Feel free to surf around the blog for more information on Do It Yourself (DIY) electric car conversion. I have a Vehicle I am intending to Use for my Electric Vehicle. It is a 1957 Morris Minor I’m sending Photos of it sitting in my shop! It has Rear Leaf-springs and Coil Springs in the front. It also has original Rack& Pinion Stearing! A 4speed Manual Transmission ,Rear Wheel Drive, And original Breaks which I will go to a custom build disc break application, with help from a machine shop!!! I hope to be able to do disc brakes on both the front and the rear of the little car! I have the front and rear bumpers ,but the front grill is damaged ,so I’m going to do a custom front that will give an idea that the little car (maybe) doesn’t have a rad in it! I also have a 1983 Toyota Corolla 2door hardtop that is in great shape with just dried out valve seals! it could be a good canidate for a EV upgrade!!! and my wifes car might become a EV in the future ,it has a possible head gasket leak and the automatic transmition is being quite weird! It’s a 1998 VW Beatle bright Yellow!!! I’LL wait on that one to see how the morris goes!!!?? it sounds like your Morris Minor has all the characteristic of a great donor car for an electric car conversion project. All the best to you. Can you tell me what specific things shud I keep in mind when I am going for this conversion kit to make a hybrid. I mean, I know I cant make it more expensive, but I don’t want to know all the factors I need to keep in mind. Yes, I am doing a lot of research now n then to find out where can I cut the cost. I know I may sound highly impossible if I say “I want to cut down the cost of conversion kit to $1000 t entry level and $1500 – 2000 for an average kit”. But I want to make this happen and am trying my best to see how it can be done. Earlier I had once designed a vehicle with ZERO transmission loss. This time, something which can make a huge revolution. Using lead acid cells will cut down the cost but increase the weight. Not practical (for me). But if I use high Ah Lithium Ion cells which are lighter but yeah, expensive as of now, but will need just one or two to meet the requirement. 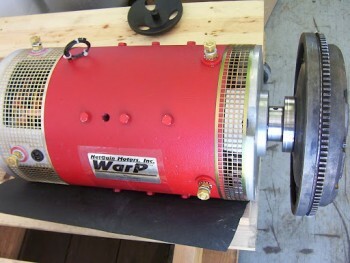 Coming to the motor, I need just one or tow or very few to run a 15-25KW 3phase ac induction motor. Planning to use torque convertor, if torque becomes less, but I need your help here. How do I assemble all these under the same hood? What all components are required? Most of my research was done on pure plug in electric car. I know what’s involved in an electric car conversion project where you remove the internal combustion engine and replace it with an electric motor. As for DIY hybrid car conversion where it uses both the internal combustion engine and electric motor, my knowledge is very limited in that area. Sorry. I would suggest you sign up with the DIY Electric Car Forum at http://www.diyelectriccar.com/. Sometime when I have a technical question that I couldn’t figure out, I’ll post my question there and the guys there may know the answer. How did your Morris Electric Car Conversion go? Did you go clutchless or did you retain the clutch? What sort of motor and controller did you end up using? What sort of hybrid were you thinking of building? Parallel Hybrid: An electric motor and internal combustion engine (ICE) [gasoline, diesel or gas motor] are connected to the transmission of the vehicle. The electric motor and the internal combustion motor can be used to drive the wheels of the vehicle. The electric motor can act as a generator to charge the batteries under certain conditions. Series Hybrid: The electric motor is used to propel the vehicle. The internal combustion motor (ICE) is not connected to the transmission or driving wheels of the vehicle, but used solely to charge the batteries. Sometimes the ICE used to charge the batteries is known as a range extender. Hi-i’m thinking about doing an ev conversion to a donated (i hope) mercedes-benz 2dr coupe-is it too big to be a good conversion? i’m thinking about this seriously, even though i won’t have an indoor place to do the work. my confidence stinks cause i’m about as mechanically inclined as a fart, but i’m willing to try and i’m not afraid to get dirty-i’d love to get off the fossil-fuel merry go round…email me-maybe you can answer my questions-please? ron.